What is a payout guide? How do I find a virtual payout guide? Mobile (iOS & Android): swipe left or right. PC: click the page numbers at the bottom of the guide. The first page of each virtual payout guide explains how to play the slot machine. 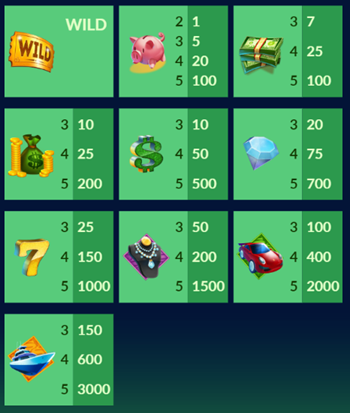 The second page of each virtual payout guide shows the slot machine's symbols and multiplier values. How do I read the symbol/multiplier chart? Left column: the number of symbols that must appear in a row on a valid payline to count as a win. Right column: the multiplier value that will be applied to an individual virtual line-bet to determine your virtual payout if you hit the corresponding number of symbols in a row on a payline. The first number combination, 3 - 20, shows that: If you hit 3 diamond symbols in a row on a payline, a 20X multiplier will be applied to the virtual bet on that payline to determine your virtual payout. 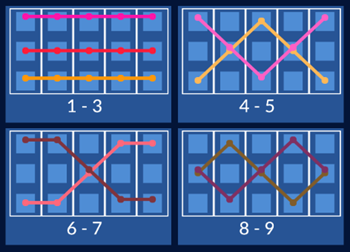 Similarly, the second combination, 4 - 75, shows that: If you hit 4 diamond symbols in a row on a payline, a 75X multiplier will be applied to the virtual bet on that payline to determine your virtual payout. The third page of each virtual payout guide shows all of the slot machine's paylines. Paylines are specific lines along which series of symbols count as wins. Please note: Paylines may vary by slot machine. 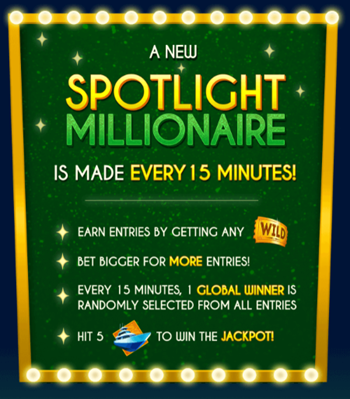 Check each slot's virtual payout guide to see the number and position of available paylines.